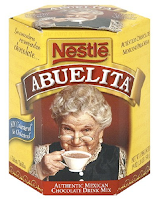 When a recipe calls for chocolate, I typically just grab a Hershey's bar at the checkout line. I know it's not the traditional approach to chocolate foodery. I'm sure there's something about Hershey's melting point or oil content that's contraindicated with real Iron Chef cooking. But I'm more of a Stone Chef. Maybe a good hardwood. Point being, I saw that fancy 100 percent stuff and figured it was just the ticket. Mole is supposed to be a sophisticated dish. This looked like a sophisticated chocolate bar. Perhaps I hoped the chocolate would lend some of its sophistication to an otherwise hopelessly amateurish and slapdash attempt at the complicated, complex, intricate, transubstantiation that is mole. This venture was, by all accounts (namely this one), severely lacking in sophistication. I had, until pulling into the grocery store parking lot, been intent on satisfying a craving for hot dogs. All results from my in-store iPhone research indicated mole was a bad idea. The plain-Jane grocery store offered fewer than half of the ingredients suggested by most recipes (which vary wildly, like a social circle's husband-to-wife accounts of a good bachelor party). Undeterred, I conceived of a few hail Mary substitutions, visited the store's ethnic, baking, produce, and ethnic produce sections, and headed home full of hope and hunger. The chocolate's location in the grocery store baking isle should a been a clear indication of trouble, but it wasn't until I cracked a corner of the bar into my mouth that I began to realize my error. I like chocolate well enough, even the so-called dark chocolate that's dangerous for dogs and not as fun to eat. This stuff, though, wasn't even tasty in a challenging, prove your mettle sort of way. I have licked stamps and envelopes and dirty rocks that tasted much better. In retrospect, I don't believe this stuff is actually intended for human consumption. Instead, I suspect it is made available for people seeking a sympathetic and believable way to get away with murdering their dog. I forged on. Mole, of course, was just the complimentary sauce. I still had a pork shoulder to prepare. Okay, the pork shoulder was simple, and its preparation is not worth detailing. There a many steps to making mole. Some involve nuts. And obscure oils. The chocolate didn't enter the picture for at least 90 minutes into the attempted divination process. I roasted, cooled, peeled, partially de-seeded and blended four types of peppers. I prepared garlic and onion. I mixed cumin, kosher salt, oregano and black pepper. There were a great many, other impressive things I did. There was some lard involved, and some tomatillos, though I don't think any of the recipes called for either. And, honestly, I can't attribute their presence to substitutions. It just felt right. 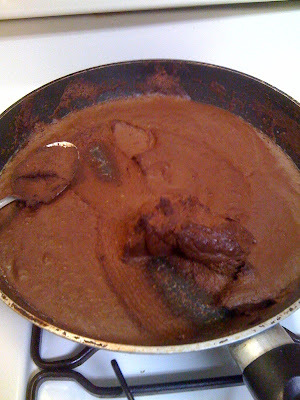 Before adding the chocolate, the mole-to-be looked, smelled and tasted delicious. It tasted nothing like mole, but it would have made a fine, though mild, roasted salsa verde for chicken or tortilla chips. But I had come this far to make mole, and so I began to add the chocolate. How much chocolate, considering the bad taste? The entire bar, of course. You see, I reckoned I could compensate for the bitterness by adding sugar and extra salt. And I must say, for a few glorious moments as the chocolate melted, darkening the green pepper slush, I really thought I had pulled this off. The appearance was perfect. It looked just like the mole sauces I have enjoyed at good Mexican restaurants. Unfortunately, upon tasting, it was immediately clear that something was very wrong. The chocolate had fully infiltrated, taken control of the ship and now controlled all flavors. Before accepting defeat, I indulged in a spirited session of attempted patchwork by way of additional sugar, salt and cooking liquid from the pork shoulder. The flavor improved modestly, but the cause was lost. For pride and mouth science purposes I ate a full, albeit small, serving of the pork drizzled with a taste of my mole. It was bad. And I'm afraid that's about it. I left the remainder on the stovetop until the following morning, when I photographed it to share with you. The morning-after consistency was much congealed from the night before, and with the dark brown color it evoked a familiar if unfortunate comparison. I'll just say cleaning the pan gave me a new appreciation of my colon.